Are you Proud of your Pantry? Your pantry cupboard is an important part of your kitchen. If this is in a mess and dis-organised, it is not only difficult to decide what to make for dinner, but it also wastes money. How many times have you gone to the store bought something only discover on your return that you already have 2 or 3 of the same product in the cupboard already! I own my kitchen, do you? Being kosher means that we can’t always get a lot of food stuffs, so I developed a habit of buying unusual kosher products, which then sat in my cupboard for years. Last year I got rid of 2 cans of waterblommetjies. They had expired 3 years before. The expiry dates on canned good is not really an expiry date but more of a date of when the producers will no longer guarantee the quality of the product inside. As long as the can is not bulging your food is safe to eat. I did think, however, that having sat in my cupboard at least five years and still not been used in a recipe, it was unlikely that I would ever make a waterblommetjie bredie (stew). There were also other products that needed to be tossed. 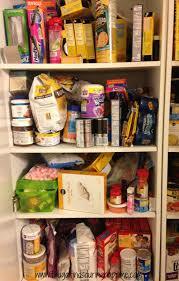 Keeping your pantry cupboard tidy and organised is a must if you want to stop wasting time and money. If you ask a family member to look into a disorganised pantry cupboard and pick something to make, 9 times out of 10 the answer will be, ‘there’s nothing to eat’! Keeping items of a similar kind together will definitely make your time spent in the kitchen easier, cut down on your grocery bill and allow you to use up products before they expire! It doesn’t need to be OCD tidy to be organised. If you have all your baking ingredients, your pasta’s and cans on their own shelves, condiments together on another shelf and spices together on a different shelf, you are what I consider organised. Items don’t need to be alphabetised or facing the same way, unless that’s what you want of course, but being arranged like with like will be enough. 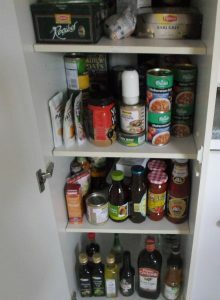 Follow in the group as we get through the week with short daily tasks to organise the pantry cupboard https://www.facebook.com/groups/gettingsorted/.